Bacon burger sliders on homemade rolls! How cute is this little burger? I got the idea for these burgers from Wendy’s restaurant. My Husband kept seeing their Bacon burger on pretzel rolls and he has been bugging me to go. I originally was going to make pretzel rolls, but timing wasn’t on my side. So I did the next best thing and made Sally’s Baking Addiction 30 minute pretzels. I turned her pretzels into homemade rolls. They are moist, light, fluffy and I added salt on top to give them a pretzel taste. Sally’s pretzels are one of my Husbands favorite recipes. When I first discovered her recipe we were eating pretzels weekly. 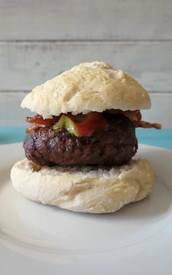 It’s a fantastic recipe and goes great with my little Bacon burgers! !